Leading Melbourne naturopath Jason Eldridge has long been a renowned specialist in treating inflammatory and digestive conditions such as Crohn’s disease and ulcerative colitis. His passion has lead him into specialising in oncology support. 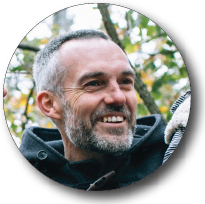 Jason has been practicing naturopathy for over 15 years, helping many people get well and stay well by using traditional knowledge together with the very best of modern research. Jason aims to uncover the underlying spiritual cause for disease and suffering, to bring deep levels of healing using safe, effective natural remedies to help you realise the soul’s full potential. Jason is a lecturer at the Endeavour College of Natural Health (Australian College of Natural Medicine) where he teaches ‘Food as Medicine’ and ‘Rayid Iridology’. He lectures Rayid Iridology both nationally and abroad. He has undertaken extensive study with Denny Johnson (the founder of Rayid) and is a qualified Rayid Practitioner and Rayid Teacher with Rayid International. Jason also has undertaken extensive research into nutrition and mental health, assisting in the development of HealthQuest Neurograph to assist practitioners in the analysis of brain neurotransmitter deficiencies such as serotonin and dopamine. Jason also developed the biochemistry module for HealthQuest helping practitioners interpret pathology tests from both a western medical and nutritional perspective. Jason has a long standing passion for natural therapies and has been helping people back to vibrant health since 1991 when he started his own All Earth Health food store. I am a qualified shiatsu and Level 3 SCENAR practitioner, member of the Shiatsu Therapies Association Australia, SCENAR Therapist Association Australasia and registered with all health funds for rebates. I work out of Studio 22 aka Sunbear Cave in Northcote, Melbourne. I am also available for treatments at your home within a radius of 10 km’s– please contact me by text or email to request a visit. I am passionate about shiatsu, with its nourishing nature and subtle means of healing. In my clinic, I create a safe and nurturing surrounding for my clients. In my treatments, I facilitate the process of unblocking stagnation and unlocking the inner healing potential. It gives me joy to see my client leave with increased vitality and in great spirits after a session. In my spare time do breathwork, enjoy cooking with my kids and getting my thumbs green in the garden. My biggest passion is music and I pride myself in making playlists to enhance the restoritive power of shiatsu. Naturopathy is a system of natural therapies which recognise the existence of a vital curative force within the body. The origins of naturopathy can be traced to ancient Greece. Hippocrates, the “Father of modern medicine” once said “Nature is the healer of all disease” In his holistic view he recognised the body, mind and spirit linked to four elements (air, water, fire, earth) of the natural world. This organism that is body, mind and spirit is an amazing self repairing machine, given the appropriate conditions. The role of the naturopathic healer is to facilitate this process through teaching the natural way of life which advocates fresh air, pure water, wholesome foods and exercise to promote and maintain optimum wellbeing. Nature Cure is based upon these principles. Although the trials and tribulations of modern living have given rise to a contemporary naturopathy enabling us to adapt to the less than desirable conditions of the stressful modern world. The contemporary Naturopath draws on both an understanding of Western health science and traditional healing methods to treat a wide range of health conditions. Every effort has been made to ensure that the content of this website is accurate and current. The information herein is not designed to replace the expert and individual medical advice provided by your Health Care Provider. Relaxing style of bodywork, fully dressed on a futon. In a Shiatsu treatment, you lie on a comfortable Japanese style futon on the floor, fully dressed, covered by a blanket and supported by pillows and bolsters where needed. Your body will slow down and reach a full state of relaxation. You will stay warm and comfortable while the ambient temperature is adjusted according to your needs. deeper healing to take place. The element of music plays a strong part in the efficacy of your healing. You are able to choose which music you would like to listen to.